Malcolm Robson, MD of Ipswich Buses, has had a busy year as President of CPT UK, but he hasn’t been neglecting the day job. 2013 was an eventful year for the business which has faced competition from First and won a significant new contract, as I found when I visited him in the run up to Christmas. The most important achievement for Ipswich Buses during 2013 was regaining responsibility for the town’s park and ride operations which had been operated by First since 2007, prior to which Ipswich had run it for eleven years. Suffolk County Council had given serious consideration to dropping the park and ride operation entirely having already closed its Bury Road site, which once required three double deckers, in 2010. Ultimately it was decided to retain the two existing sites at Martlesham, six miles to the east of the city, and Copdock, three miles to the south west, linking them with a single service. The company offered the County Council no less than 13 options in its bid to regain the contract. These included the choice of brand new, mid life, or old buses and various vehicle types among them articulated, as well as different frequency options with each vehicle alternative. They opted for mid life vehicles of five years old. It was in June that the announcement of the company’s success was made and it started operating on 4 November. The contract is for five years with the possibility of a three year extension thereafter. Between the award and the beginning of operations the management team had to source the five year old Euro4 buses the contract stipulated. Locating eight suitable vehicles of this age was something of a challenge but in the end a batch of former Nottingham City Transport Optare Versas with Euro4 MAN engines and Allison gearboxes were acquired through ADL. All featured 39 leather trimmed seats, though two were retrimmed in e-leather. They are equipped with front, side and rear Mobitec display equipment as well as Mobitec next stop announcement systems that announce what the bus is as it draws up at a stop. This latter feature has had rather a mixed reception from regular travellers with more negative than positive feedback. The system also provides a signal that will be picked up by Suffolk County Council’s real time information displays which will come into operation in 2014 at over 180 stops around the network as part of the £18m Local Transport Plan: ‘Ipswich – Fit for the 21st Century.’ This scheme should produce significant long term benefits though in the short term the associated roadworks are hampering operation. The service runs on a 12-minute frequency from 07.00 to 19.00 every Monday to Saturday, with no Sunday service. The whole of the revenue risk is taken by Ipswich Buses, which enables them to control the prices charged. Previously, the entire revenue risk had fallen on the County Council. A return ticket costs £2.50, a group ticket is £3.00 return and a ten trip ticket is £22.50. Prior to 27 December OAPs were charged £1.00 after 09.30 and £2.00 before but since then a flat £1.20 fare has been introduced. Ticketer ticketing equipment is used which is a fully ITSO compatible platform ensuring it communicates with the county’s smartcard schemes. Under TUPE regulations, a dedicated pool of 19 drivers have transferred across from First, along with a single person acting as bus service and car park supervisor at each of the two car parks. Combining the car park and bus service supervision roles is an innovation of the new contract that saves the cost of two people, each role having previously been split. I visited immediately before Christmas when the pale blue liveried Versas had been running for six weeks, at which stage Malcolm Robson was encouraged that passenger numbers were already above what they had been under First at around 6,500 passengers a week. Having previously been in competition with First on the 1 and 3 services to the Ravenswood Estate, against which First ran its 70 service from July 2012, in September the rival operators switched the theatre of their adversity to the 13 route serving the Chantry Estate, against which First runs the 53 service on a 10-minute frequency. 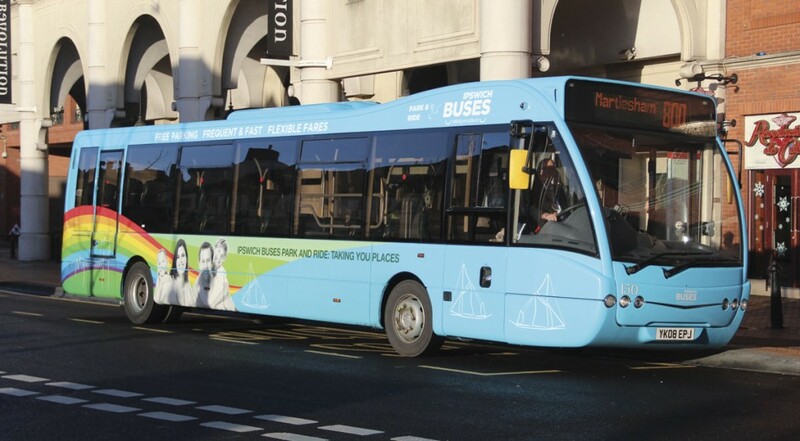 Ipswich originally ran the 13 every 12 minutes but has responded to the challenge by adding in an additional bus and matching First’s 10-minute service. Competition has also been the prompt for greatly increased marketing activity in order to build brand loyalty. To achieve this, Clare Johnson of JR Buzz has been brought in and her efforts are proving very successful. Ironically, Clare is a former Operations Director with First. Part of the brand loyalty push is focused on getting as many Ipswich Buses customers on to the company’s smartcard. This offers a week’s travel for £10 or, alternatively, ten trips for £10. It was previously £15. First matched this until 4 January, though Ipswich Buses is continuing the offer until the end of January. A Christmas Eve initiative saw Santa meet everybody visiting the Tower Ramparts Bus Station enquiry office between the hours of 10.00 and 12.00 offering them a free mince pie. Perhaps more tasty was the opportunity to purchase a week’s travel or ten trips for only £5.00 rather than the usual £10. Among other similar initiatives she has instigated are free bacon sandwiches for every passenger on the first day of the park & ride, while on Christmas Eve everyone using the service was offered a mince pie. In support of a ‘Summer Sizzlers’ offer in 2012 there was a free barbeque at Tower Ramparts one morning at which customers were given free burgers.